Maybe it is superstition, but Tony Blair has decided not to make a full Commons statement on the recent EU summit which he hosted at Hampton Court - and described elsewhere as a "damp squib". There is some dispute over whether or not this is breaking a convention, but Downing Street are not bothered either way, simply insisting it was merely an informal summit so there is no need to make such a statement. 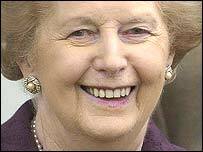 However, it was following just such an informal summit in Rome in October 1990 that then Prime Minister Margaret Thatcher departed from her prepared Commons statement to deliver to MPs her now famous "no, no, no" speech about Jacques Delors' plans for the EU's future. That off the cuff remark so infuriated her deputy Geoffrey Howe that he resigned his job, delivered a devastating attack on his boss and, ultimately, brought her downfall. Sometimes MPs seem to be their own worst enemies. Under the Freedom of Information Act 2000, they are now required to publish an annual breakdown of the allowances, over and above their salaries, which they claim from the public purse. The figures come under nine different headings including staff costs, travel, stationery, overnight allowances and so on. These are made available for public consumption by the Members Estimate Committee chaired by Speaker Michael Martin and including Commons leader Geoff Hoon, his shadow Chris Grayling and one senior backbencher from each of the three big parties. But the committee has ruled that no individual totals should be published, only the detailed breakdown of the figures and one global total for all the claims. After a quick bit of adding up, that total comes to £80,844,465 for 2004-05 compared with £78,045,149 the previous year. So press and public are presented with an electronic file or paper copy listing all 659 MPs with nine expenditure headings - if they want to find out how much each MP has claimed in total they have to add the figures up themselves. Similarly, if they are interested in discovering how much the taxpayer paid for all MPs travel, they have to get out their own calculators. Most computers will open this document automatically, but you may need to download Adobe Reader. As if to add insult to injury, the figures are published at 1530 on Thursday afternoon - horribly close to most national newspaper deadlines and at a time when many MPs are either away from the Commons for the weekend or on their way off to their constituencies and can be extremely difficult to track down. The simple question on the hacks lips is "why?". The equally simple answer is "it's the committee's rules". Still, after some frantic calculator use, it emerges the MP who claimed the most allowances in 2004-05 was Labour's Geraint Davies, who lost his Croydon Central seat in the May general election. He claimed a total of £176,026 on top of his salary. Despite representing a constituency on the edge of Greater London, he took £20,024 to cover the cost of staying overnight in the centre of the capital on parliamentary business - £878 less than the maximum allowed. Labour's Dennis Skinner, of Bolsover, claimed the least expenses for an MP who served the full year, taking a total of £75,487. So who would you rather meet face-to-face, a Dalek or the two men battling across the space-time vortex to lead the Tory party and save the human race? Billie Piper and the latest Dr Who villains? Hard luck for Dr Who star Billie Piper then - she got David Davis and David Cameron. At least she knows how to deal with a Dalek. Blasting the two Davids might have cast a bit of a cloud over the National Television Awards 2005 ceremony at which they were presenting her with the prize as best actress. Mind you, that did not stop some of the audience booing the would-be leaders as though they were the villains of the piece and deserved to be vaporised. Ms Piper was suitably astonished at her well-deserved success and the two Davids - after quipping about who should leave first - kindly left the stage before things turned really ugly. Now I want to see a Dalek running for leader of the Tory party. Now this is one event that was bound to be oversubscribed. A lecture entitled "The News We Deserve" to be addressed by work and pensions secretary David Blunkett. That's the former home secretary who quit after it emerged a visa application for his ex-lover's nanny was fast-tracked and who, since being rapidly rehabilitated back into the cabinet, has come under persistent media scrutiny. His affair with magazine publisher and mother of his child, Kimberly Quinn, has been the subject of an hilarious stage play and TV drama "A Very Social Secretary". So, should be a lively lecture then. Except Mr Blunkett has cancelled and the event is off. Holy soft furnishings - is this the end of Tony Blair's sofa style of government? MPs are up in arms (a bit) at the latest ruling by Commons officials that they can no longer have sofas in their rooms. Indeed, when some moved offices after the general election they were dismayed to discover their sofas did not follow them. The official reason is simple. According to the Serjeant at Arms department, sofas do not feature in the "furnishing standard for members for reason of cost of purchase, and maintenance and a need to make more space available for filing, new technology and group meetings". But what has angered MPs is that they were not consulted and the new rules appear not to apply to ministers, who have been allowed to keep their sofas. So why was the result of the first Tory leadership ballot delayed by 10 minutes? Did Ken Clarke demand a recount when it looked like he was about to be kicked out of the contest by only four votes? Or was there a tie for fourth place which also required another look at the ballot papers. Both these theories ricocheted around the Commons in the heat of the moment. The truth, needless to say, was far more prosaic. It simply took longer to count 198 votes than had originally been predicted. Fascinating to see who is being invited to Baroness Thatcher's 80th birthday bash in Knightsbridge on Thursday. But so will Prime Minister Tony Blair, who invited her into Downing Street shortly after his election in 1997 and has always rather enjoyed being described as her political heir. But apparently Michael Heseltine can not look forward to an invitation. Hardly surprising bearing in mind his greatest claim to fame is probably as the man who finished off the Iron Lady. Perhaps more interesting, however, is the fact that of the remaining four Tory leadership contenders only the two right wingers, David Davis and Liam Fox have been invited. Euroenthusiast Ken Clarke has, perhaps unsurprisingly, been forgotten and the Baroness "doesn't know" David Cameron. What is more difficult to work out nowadays is whether their campaigns will gain or lose from being left off the list. First day back after the long summer recess and, sure enough, the security around the Commons has become noticeably tighter. 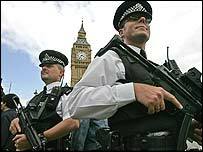 Permanent barriers now run along the length of the palace, roads have been narrowed to add a new security check point, the bullet proof screen in the Commons chamber has been enlarged and there appear to be far more police officers around than before the summer. It is all very reassuring and will hopefully make the terrorists think twice. Fathers for Justice, on the other hand, will probably just see it as another challenge - particularly after one of their number managed to scale Big Ben in the recess. It can finally be revealed - Tory leadership contender David Cameron HAS smoked the evil weed. He doesn't boast about it and has even tried to vaguely cover it up. But at least one political journalist has first hand evidence that he not only smoked, but inhaled. So that is two of the would-be Conservative prime ministers - Ken Clarke is the other - who enjoy a cigarette or cigar from time to time.